Once the 2013 Legislative Session winds to a close, you may be looking for some tools to help you review and decipher the products of the last one hundred twenty legislative days. The OLLS is already working on several publications to organize and present the legislation that results from the First Session of the Sixty-ninth General Assembly. 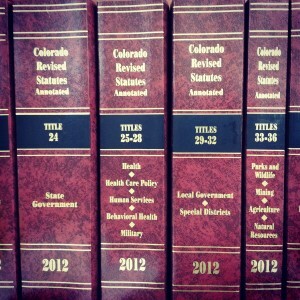 Statute directs the Office of Legislative Legal Services, on behalf of the Colorado General Assembly, to prepare, publish, and distribute the Digest of Bills, Session Laws of Colorado, Red Book, and Colorado Revised Statutes after each legislative session. These four publications document the work of the General Assembly in different ways and are available in print and electronic formats. The electronic formats are free to the public. Anyone can access them on the General Assembly home page by clicking on the blue “Statutes and Session Laws” bar. The first publication may be the most useful for persons who want a quick overview of the work completed during the legislative session. The Digest of Bills contains a summary of each bill enacted during the legislative session, organized by subject matter. The OLLS publishes a preliminary digest by the last day of each legislative session that includes all of the bills that have passed and that the Governor has signed or allowed to become law by that date. The OLLS then publishes the final digest for each legislative session following adjournment of the legislative session, after the Governor has taken action on the bills enacted during that session. In addition to summaries for all the enacted bills, the Digest provides statistics and bill information for the most recent legislative session, located in the front pages of the publication. Electronic versions of the Digest of Bills are available on-line and date back to 1933.
the date that the Governor signs the Act into law or allows it to become law without a signature (except the Appropriation Supplemental Acts and the Long Appropriations Act, which are generally chaptered at the end of the Session Laws). The Session Laws do not include Acts that the Governor vetoes. The Session Laws are helpful if you are interested in seeing how an Act changes the existing law. Since the Session Laws reprint the text of each Act, they show the language removed by the Act as stricken type and the language added by the Act in the small caps font. The Session Laws also identify the prime sponsors and co-sponsors for each Act. In addition to the Acts, the Session Laws include select joint resolutions and memorials, appropriations and other nonstatutory Acts of interest, such as the Administrative Rule Review Act, as well as all initiated and referred measures passed by a vote of the people in the most recent statewide election. The Red Book is a companion publication to the Session Laws. 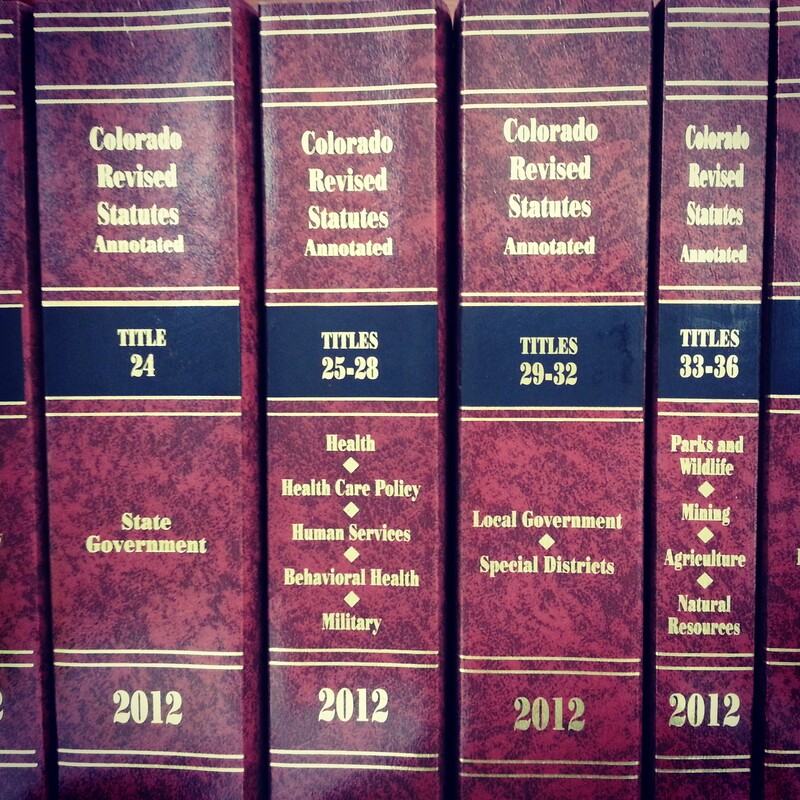 It is a detailed index of all of the statutory sections in the Colorado Revised Statutes that are amended, repealed, or enacted in the Acts that the General Assembly passes during the legislative session. The publication organizes the information numerically, both by C.R.S. section number and bill number. In addition, the Red Book contains footnotes that provide information regarding petition clauses, the harmonization of bills, and whether the passage of one Act affects portions of another Act. The Red Book provides a quick, at-a-glance resource for determining whether and how the General Assembly changed a specific statutory section during the legislative session. The OLLS publishes the Session Laws and the Red Book shortly after adjournment of the legislative session, after the Governor has either taken action on the Acts or allowed them to become law without signature. Electronic versions of the Session Laws are available on-line and date back to 1993. Electronic versions of the Red Book are found within the Session Laws listings and also date back to 1993. (C.R.S. ), which contain all Colorado state laws of a general and permanent nature. The Revisor of Statutes and the OLLS staff compile and edit the statutes each year under the supervision of the Committee on Legal Services. The C.R.S. are organized into 44 titles based on subject matter (titles number up to title 43, with a title 25.5). 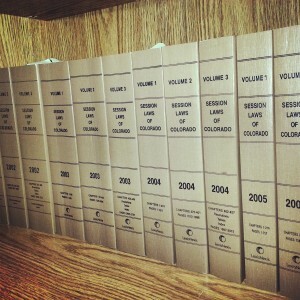 Each volume contains a specified number of titles, except the first volume, which contains the state and federal constitutions in addition to titles 1 through 3, and the last four volumes, which contain the Colorado court rules, indexes to the statutes, and comparative tables of reorganized areas of law. The C.R.S. also include historical information in the form of source notes, editor’s notes, cross references, and, as appropriate, annotations of federal and Colorado court decisions that interpret the Colorado statutes. In most years, the C.R.S. are printed and distributed and become available on-line in September. 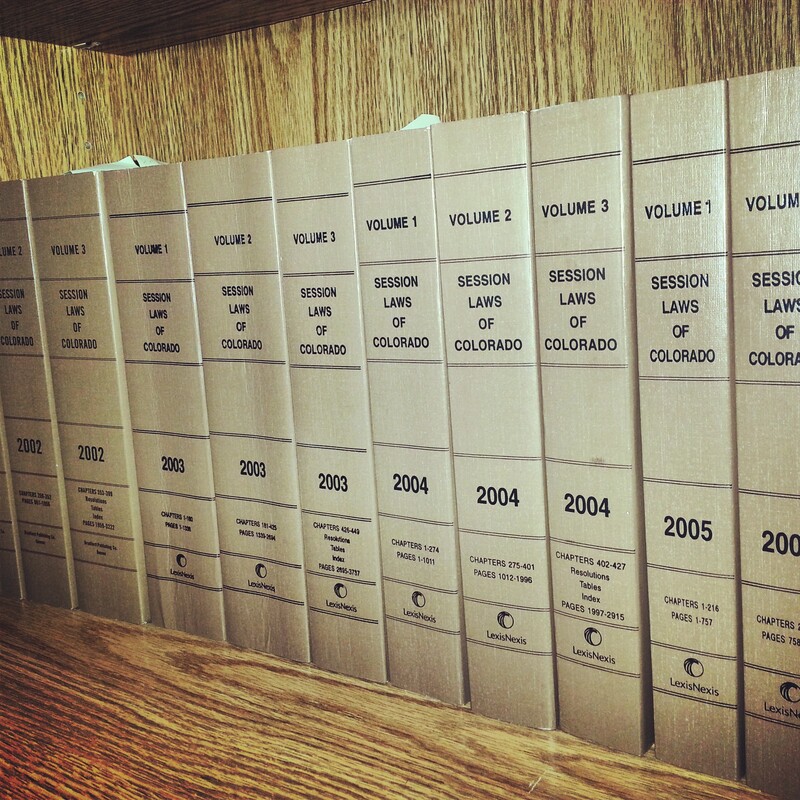 Currently only the most recent version (2012) of the Colorado Revised Statutes is available electronically.